Amanda C. Mathis was born in Orlando, FL and currently lives and works in Brooklyn, NY. 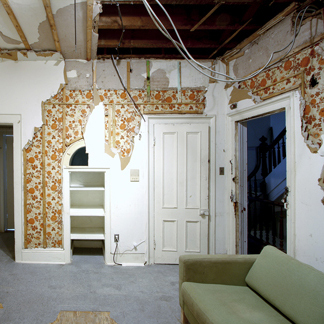 Her work encompasses site-specific interventions, photography, collage, and notions on dwelling in modern day society. She received her BFA in ceramics from the University of Central Florida (2004) and her MFA in sculpture from Pratt Institute (2006). Mathis has executed large-scale installations for solo exhibitions at James Nicholson Gallery (New York) and Smack Mellon (New York). Selected group exhibitions have I Can’t Quite Place It . . . at Smack Mellon, Between To and From at at the Visual Arts Center of New Jersey (Summit, NJ), Associated with Open Source Gallery (New York), and Interrogations, Interventions, and Modifications: Four Artists Employ Architectural Strategies at the Freedman Gallery at Albright College (Reading, PA).